Prince William’s Balding Hair Fixed For Wedding Day! Home → Damien Zone → Prince William’s Balding Hair Fixed For Wedding Day! The royal hair and makeup people are putting the final touches on Prince William for his spectacular wedding today. He may be young and handsome, but there is a lot of work that needs to be done when you are going to be seen by 1 billion or more people. As this goes to press, a miracle badling cure is being applied to Prince William’s head, and while the cure only lasts for a few days, it has bald Brits scrambling to buy the process. “We have added a little spray-on hair to William’s balding head and then went on to use my top-secret formula to further enhance the balding head of the Prince, “said Barry Greenblatt, the owner and head stylist at Greenblatt Hair Replacement on Route 1 in Edison, NJ,USA. “I am honored to be have been asked by the Royal Family to do a touch-up on Prince William’s hair for this wonderful occasion. I just finished doing my nephew Harold for his Bar Mitzvah and he came out looking great. I was able to create a look that would suggest a 35% increase in hair volume. Harold is only 13, but he’s badly balding as is William. “I think by the time the carriage rolls out onto the street, Williams baldness will be barely noticeable — at least for 24 hours. I have perfected this technique on all the young, ugly and creepy and pimply and balding teenagers in my family and throughout the gated community in Deal, New Jersey where I live. It’s fabulously yet garish and nouveau tacky city by the sea in New Jersey with multi-million dollar homes — one of which is mine, despite the fact that prior to this anti-balding kit I had no discernable source of income and neither do any of my neighbors. How does Greenblatt do this? How does he make a balding man look like he has hair for a day? “I coat the head with 100 coats of Rogaine and in about an hour, if the person does not die from vasodilation and heart failure, millions of tiny hairs start to grow in a few hours. I then brush these hairs with a microscopic mascara type brush. As the hairs get larger I use a larger brush — and so on and so on and so on until the hair is almost life sized. 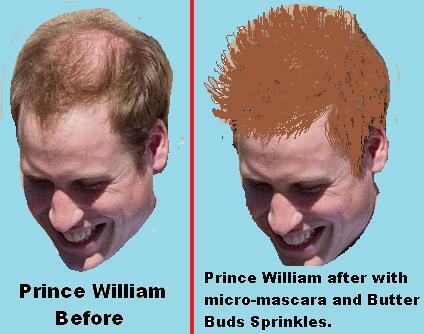 Greenblatt’s technique of using massive, almost fatal doses of Rogaine and then topping this all off with Butter Buds Sprinkles is the latest rage in the UK, and commoners lined up for miles can’t wait to see the full, yet temporary, head of hair that Prince William will be sporting. “I expect that I will be selling a few thousand gross of my hair restore kit after the wedding, said Greenblatt. Well TheDamienZone is happy that William will have a Prince of a mane for his wedding day and we’re happy that thousands of Brits will be able to buy Greenblatt’s One Day Hair Restore. It’s hard to believe that rotted Butter Bud Sprinkles and microscopic mascara brushes can fill in a bald head for a day or two, but the cure seems to work. Look for it at an As Seen On TV Store near you because Greenblatt’s store on Rout 1 in Edison is planning a fire and an insurance collection in the coming weeks.